When moist air enters a vented crawl space, condensation occurs on cool crawl space surfaces. Crawl space humidity has been plaguing homes in Tennessee and Kentucky since they were first built. As the space becomes increasingly humid, moisture will condensate on the surfaces in your crawl space, leading to serious problems in your home. Most of the problems traditionally associated with damaged, rotting crawl spaces are due to basic flaws in the ways that crawl spaces were designed. We offer free crawl space repair quotes in Clarksville, Jackson, Nashville and many areas nearby. To schedule your free appointment, call or e-mail us today! When the frame of your home was first built, it was a large wooden box, with few, if any, holes in it. Then came the other contractors. As plumbers, electricians, HVAC workers, and countless other professionals began to work in your home, they began to cut channels in your walls and floors. Pipes, wires, cables, ducts, and other things were passed through, and your home's construction was completed. Then, over time, your home began to expand and contract. The once-tight seams began to warp slightly, and more crevices and openings appeared. There are a lot of openings between your first floor and your crawl space! In your home, warm air rises, leaving through your attic and upper floors. As this happens, a vacuum is created on the lower floors. Air from the outside -- and from your crawl space -- is pulled upwards to fill the space. If you have crawl space vents, they will also become part of the air movement in your home. As air is pulled out of the crawl space and up into the home, new air will be pulled in through these vents. Here's the key point: If the air outside is wet or humid, then your crawl space vents are bringing in moisture. Wood that stays damp in a dark crawl space is an ideal mold habitat. Eventually, mold causes wood decay that can destroy structural parts of the house. As humidity builds in your crawl space, it creates an ideal space for mold and rot to grow. As it does, all organic material in your crawl space will be damaged -- including wooden floorboards and support beams. A rotting crawl space will begin to sag, creating uneven floors above. In some extreme cases, sections of the floor may even begin to cave in! additionally, many pests (termites, carpenter ants, wood-eating beetles, crickets, et al.) love rotting, moldy wood. Your open vents will be an invitation for them to move in. As mold and rot increase and animals begin to live (and die) in your crawl space, odors will begin to rise into your home along with the crawl space air. Mold spores are a known allergen, and they can significantly affect anyone in the home who suffers from asthma or allergies. Of these, the easiest to control in your home is moisture. Fortunately, controlling crawl space humidity is easy! At Frontier Basement Systems, a crew of our crawl space contractors can usually install a moisture control system in less than a day. We recommend starting by sealing those crawl space vents, then following up by installing a crawl space vapor barrier on the walls and floors. A dehumidifier is a great finishing touch, drying out the space and helping you to preserve your home. Click to read more about crawl space vapor barriers! At Frontier Basement Systems, crawl space repair is our specialty, and we'd like to show you why we're the best. To help you decide which repairs are best for you, we offer free crawl space repair quotes to homeowners in our area. 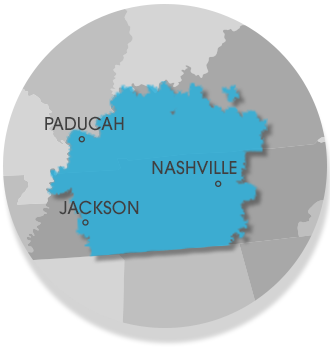 We serve Tennessee and Kentucky, including Clarksville, Nashville, Jackson, Owensboro, Murfreesboro, Bowling Green, Philpot, Utica, Fayetteville, Marion, Franklin, Leitchfield, Paducah, Mcminnville, Hartford, Antioch, Shelbyville and many areas nearby. To schedule your free quote, contact us today!